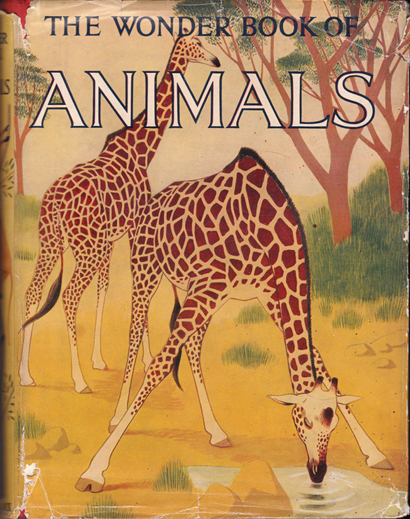 The Wonder Book of Animals – George Cansdale, et al. Author: George Cansdale, et al. Illustrator: L.F. Savage, J.F. Campbell, et al. Description: "Of all wonderlands in which to roam, the most enchanting is definitely the wonderland of animals." Contents include pieces on birds, mammals, lizards and insects all of which are accompanied by hundreds of excellent b&w drawings and high-quality photographs – many of which are full-page. Features 8 stunning colour plates plus beautifully illustrated blue monochrome pastedowns and endpapers. Pictorial boards with red cloth spine. Black text and illustration of penguin on latter. Boards repeat jacket design and are in excellent condition. Corners slightly bumped; spine straight. Price-clipped jacket is worn and torn (refer to image), but remains 95% complete. Gift inscription in blue ballpoint on front flap. Pages are in superb condition for their age: bright, crisp, unmarked and completely free from foxing. There is just a hint of tanning in the gutter. Measures 25 cm × 18.5 cm (10″ × 7.4″). 4to. 24 pp.